We all know that starting your day with a good breakfast is an essential key to having a successful day. Ever since we began homeschooling a few months ago, my older boys have been reminding me of this fact daily as they attempt to delay the start of our school time by stretching out breakfast by eating as s-l-o-w-l-y as possible. Even a “quick” bowl of cereal turns into 30+ minutes! 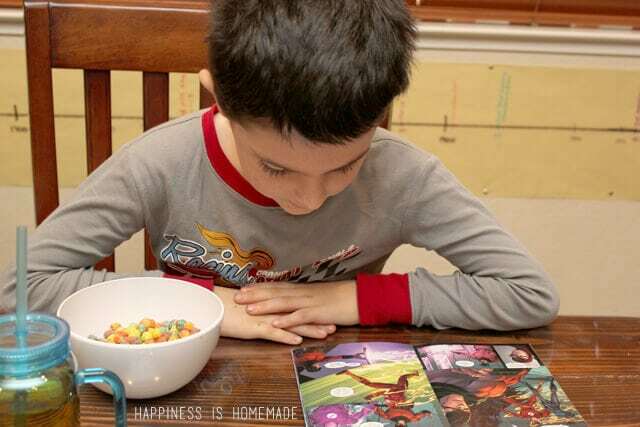 Luckily for me, Big G Cereal has come up with a brilliant idea that puts breakfast and reading hand-in-hand – free DC Comics Justice League comic books inside your cereal box! 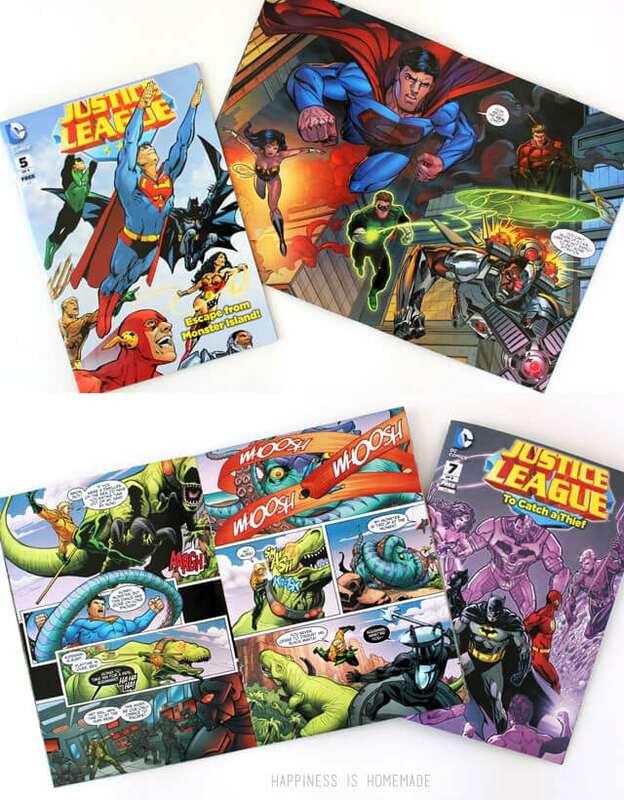 From now until the end of April (while supplies last), you can get one of four Justice League comic books inside of specially marked packages of these Big G cereals – Cinnamon Toast Crunch™ (12.2 oz. and 21.25 oz. ), Lucky Charms™ (20.5 oz. ), Honey Nut Cheerios™ (12.25 oz. and 21.6 oz. ), Trix™ (10.7 oz. ), Cookie Crisp™ (11.25 oz. ), and Reese’s® Puffs® (13 oz.). A bonus fifth comic is available exclusively at Target in specially marked Cheerios. 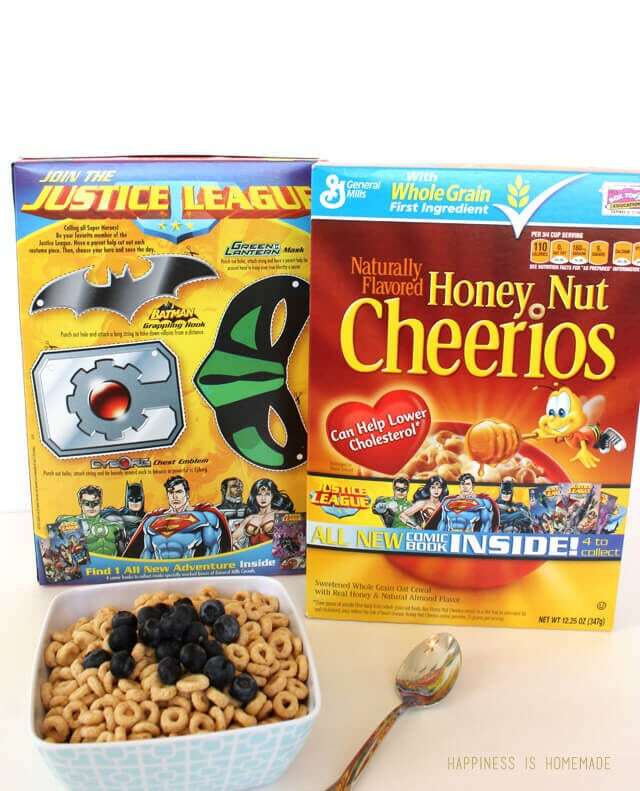 Each box of cereal also comes with Justice League cut-out costume pieces on the back of the box for your own #SuperHeroing dress-up fun! 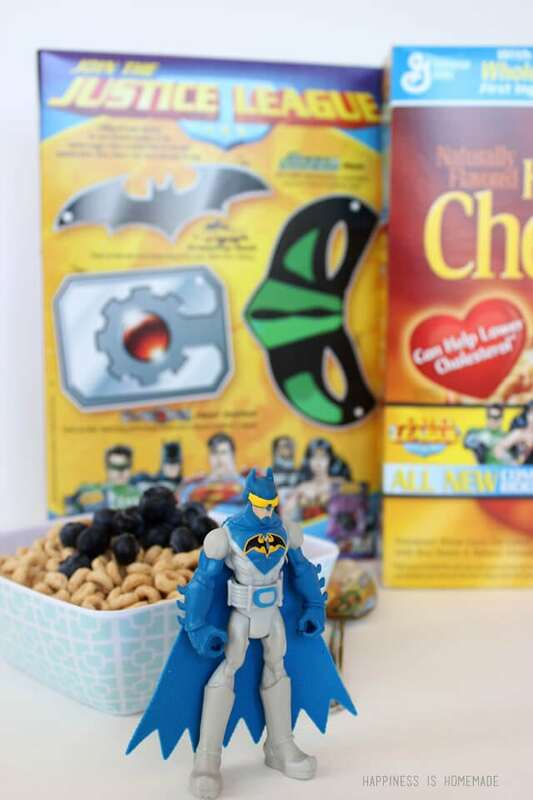 This breakfast combo is Batman approved! I set out bowls of cereal, fresh fruit, milk and apple juice for my boys along with the Justice League comic books and costume pieces, and it was a HUGE hit! 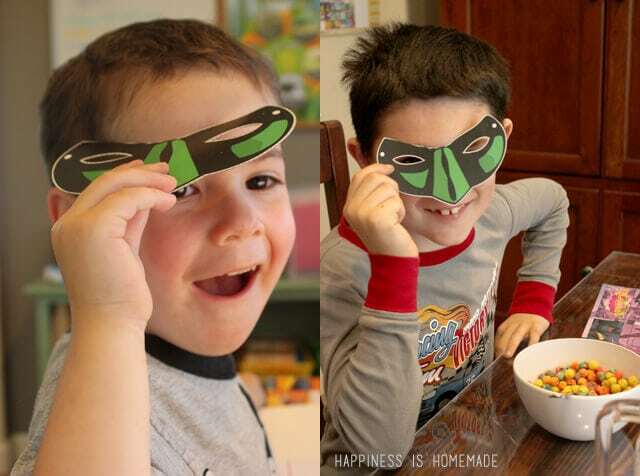 The boys were thrilled to try Trix for the first time, and the fact that their Trix came with a Green Lantern cut-out mask was icing on the cake! The boys loved the costume pieces, but the real star of the show was the Justice League comic books. Sutton was so enthralled with his new comic book that he read the entire thing before he even ate any of his breakfast! I love that all three of my boys delved right into the comic books, and I was able to sneak in some morning reading practice without them even realizing it! It made for a perfect and smooth transition from breakfast time into the rest of our school day. I discovered Sawyer, my reluctant reader, deeply engrossed in his comic book again a few hours later, and I was so happy to see him willingly reading on his own. Now that’s super hero power! He was excited to discover that you can read Part Two of the comics online, too. 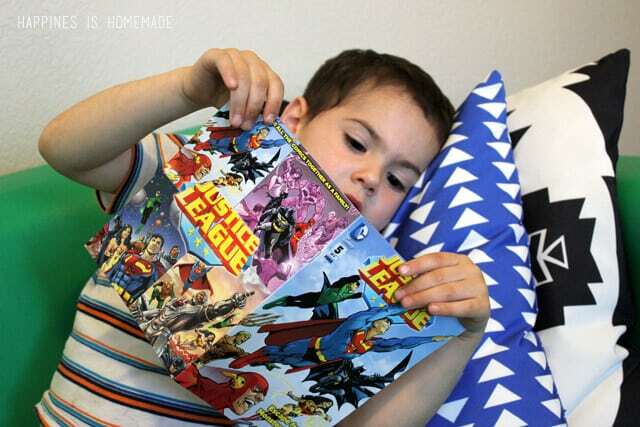 This was Simon’s first time reading a comic book, and I think he’s hooked, too! 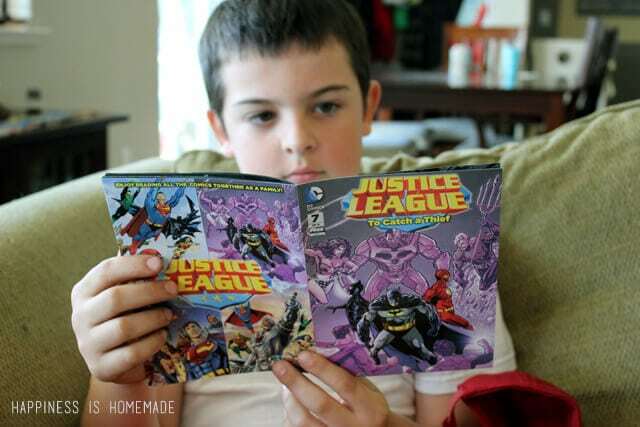 I foresee lots more Justice League comic books in the future for this household! I just bought a box of cereal with the comic logo on the front. I didn’t know what it was until I read this! We are in Northern Cali as well and my kids just loved pretending to be superheroes. Your kids look like they were loving the comics!